During your hands-on experience, select the pieces of colored Japanese washi paper of your choice, affix it to the bamboo frame and dry. 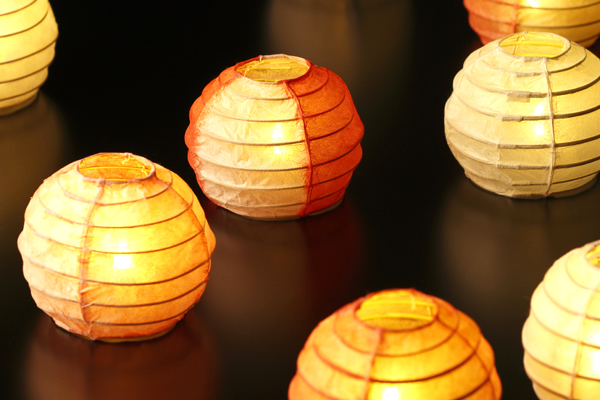 Complete your paper lantern by putting a small LED light inside. What I like the most from lantern making workshop is the opportunity to talk and learn from the real artisans, in the real environment. It was very enjoyable time. I also like that I can get the lantern back to home with a set of battery. It is so convenient to use at home (and it reminds me a good experience there). Although, I hope I could have a chance for something that is unique and required more skills to make, but a good point here is everyone can enjoy this! It is easy and the final piece is a nice souvenir to bring back to home. A magical experience! I could choose the washi paper I wished, so I chose my favorite colors, green and purple. The expert kindly showed me how to glue it on the bamboo frame and then he helped me tear the edges gently and glue them in place. Before long my chochin was ready. My family likes it very much!! It glows softly on the table now…!